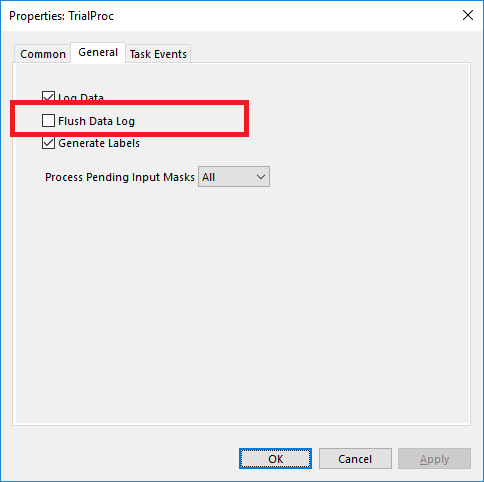 E-Prime 2.0 introduced a FlushDataLog option on the Procedure object. If the FlushDataLog box is check marked then the object flushes its log data after logging. Additionally, E-Studio generates c.DataFile.Flush at the end of the Procedure. The default value for this property is unchecked. The flushing of the data file is typically not required. 12/28/2012 12:25 The notation "Procedure.FlushDataLog" implies that FlushDataLog may be called as a method of Procedure objects, but this would be wrong. Procedure objects have no FlushDataLog method, and trying to use such a method with inline code will result in a compile-time error. Rather, "Flush Data Log" is a flag on the Property Pages of Procedure objects in E-Studio, and it acts as a directive to the code generator to generate additional E-Basic code to provide the function described above; to be precise, it simply adds "c.DataFile.Flush" just before the "c.Log" at the end of the Procedure.